This week’s installment of the Sunday Spotlight on the Non-Western Cello is about Dutch cellist, Saskia Rao de Haas. I first learned about her and her work playing Indian music on the cello some years ago. I finally picked up a copy of the CD, Creating Waves (released on Rhyme Records), that she and her husband Shubhendra Rao (disciple of Pandit Ravi Shankar) for which I am very grateful as at the time only a few audio clips of Saskia’s work was available at her old website. Saskia Rao-de Haas is a brilliant cellist and composer from the Netherlands. She is based in New Delhi, India where she is recognized as a well-known exponent of Indian Classical music. 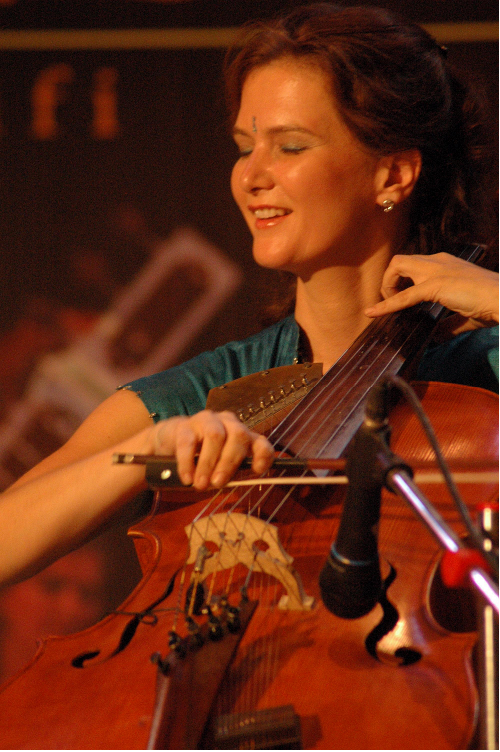 Saskia is hailed as a pioneer in the world of music for introducing her Indian Cello. Speaking about Saskia in an interview on National Television, her Guru Pandit Hariprasad Chaurasia said,“Saskia has been taught by God and everyone should listen to her music”.